Why the Tekken Team Isn't Developing the New Smash Bros. While Smash Bros. creator Masahiro Sakurai is helming the upcoming Smash Bros. titles, Namco Bandai is developing the games. But does that mean the Tekken team will be making the games? 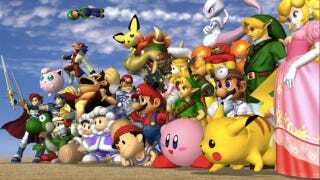 Just How Much of the New Smash Bros. Is Namco? A Lot, Apparently. When asked by Kotaku whether or not the Tekken team was involved with the new Smash Bros., Tekken producer Katsuhiro Harada stressed this: "Sakurai is directing." Harada also added that Namco, of course, has lots of experience making fighting games. However, said he would not be saying how the new Smash Bros. should play or saying what characters should appear in the game. Harada was very clear that even though Namco is developing the new Smash Bros., Sakurai is in charge of them. They are still very much Sakurai's games. "We'll be providing our expertise when asked," said Harada, "but it's not like we'll (the Tekken Team) be making the game." That does not mean developers with Tekken experience won't be working on the Smash Bros. games. When asked for clarification, Namco explained that developers who might have worked on the Tekken games or even as part of the Tekken Team could be assigned to work on the Smash Bros. games. Semantics, maybe, but Namco seems to think it's important to keep Sakurai and his vision at the forefront.